Properties in Cottesloe average 4.5 out of 5 stars. 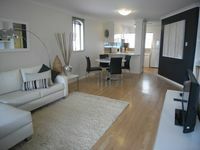 Property 7: 2 Bedroom Apartment with stunning ocean views! Absolute COTTESLOE Beachfront - Ocean Views Vista! Property 19: Absolute COTTESLOE Beachfront - Ocean Views Vista! SIMPLY THE BEST- STUDIO APARTMENT, SLEEPS 3, LOCATED IN THE CENTRE OF FREMANTLE. Property 27: SIMPLY THE BEST- STUDIO APARTMENT, SLEEPS 3, LOCATED IN THE CENTRE OF FREMANTLE. Best Value with FREE WiFi. Walk to hospitals, shops and parks. Property 29: Best Value with FREE WiFi. Walk to hospitals, shops and parks. Bel Air -between river and sea. Property 40: Bel Air -between river and sea. My family had an awesome stay in this apartment. Trevor is a great host, very, hospitable. Close to shops, train station and access to Freeways. Recommended stay without hesitation. Everything was totally fine. Sue answered really fast every question we had and was so helpful with everything. We would defenitely come back to this place! !